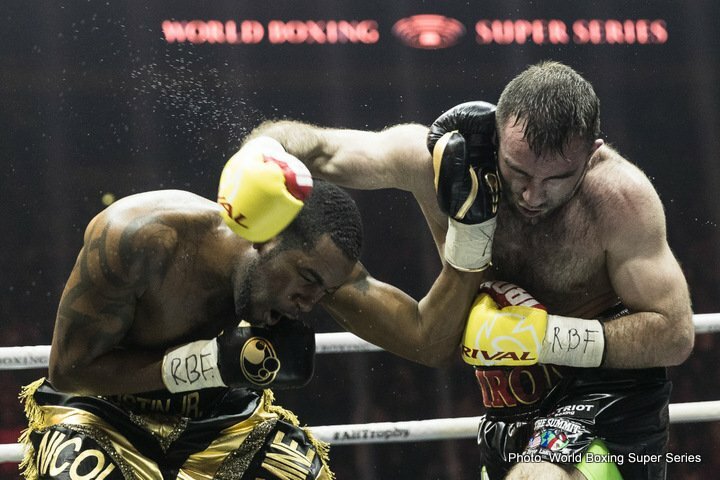 Tonight in Russia, in the second semifinal of the WBSS cruiserweight tournament, Russian hero and defending IBF champ Murat Gassiev added the WBA crown to his name as he sensationally stopped Cuba’s Yunier Dorticos in the 12th and final round of an incredible battle. Having hurt Dorticos with a huge left hook that sent the Cuban down on his back, Gassiev blasted away with his bombs, scoring a further two knockdowns, the final one forcing referee Eddie Claudio to halt the fight. Time was 2:52 of the very last round. With the win, the now 26-0(19) Gassiev also goes into the May 11 final of the WBSS tournament, against fellow unbeaten Oleksandr Usyk. Dorticos, who gave his all, falls to 22-1(21). A quite superb fight began at a hot pace and it never once came close to slowing down. Dorticos pressed the action early, pushing Gassiev onto his back foot, but the younger man from Russia (24 to age 31 for Dorticos) was the more versatile boxer, the better punch-picker. Gassiev was able to visibly hurt Dorticos a few times – the first time in round-five – whereas Dorticos, despite his best efforts, was never able to make a dent in his rival. With scarcely a clinch to be seen, the two men went at it for speedy round after speedy round. The pace was frenetic yet quite amazingly neither man appeared to get tired. Gassiev’s left hook to the head was a frequent and effective weapon, as were his hooks to the head. Both men attacked the body well at times and Dorticos fired plenty of quality left jabs. By the final third of the fight, Gassiev, with his superior game-plan and more educated punch variety, began to take over; piling up the points. An accurate and extremely hurtful puncher, Gassiev was simply unwilling to accept a decision win, and in rounds ten and eleven, he hurt Dorticos badly. The tenth was a great round, with fierce trading, while in the 11th Gassiev came on hard. Dorticos was having a good round-eleven, his inner strength and his refusal to give in being astonishing. But then, near the end of the round, Gassiev landed with hard left hooks, an uppercut and a right hand, all to the head. Then in the final session, Gassiev put the finishing touches to his violent masterpiece; scoring three hurtful knockdowns. Dorticos, one brave, brave warrior, fought his heart out in an attempt to stick in there, but he was badly hurt and he had next to nothing left. There were zero complaints about the stoppage. We witnessed a classic tonight, heaven knows how high the bar may be raised in the grand finale in May!